The show opens to the public Thursday evening at 7:30. Performances will be held Saturday at 7:30 p.m. and Sunday at 2 p.m.
“Anything Goes” is a musical version of the age-old tale of boy-meets-girl and the complications which ensue – all wrapped around one of Porter’s magical scores. The action takes place on the Ocean Greyhound AMERICA as it travels from New York and England. The music is “fun and breezy” and “jazzy,” said LC theatre professor Jeff Wittman. He chose “Anything Goes” to contrast with Cabaret, last year’s musical with much more foreboding themes. 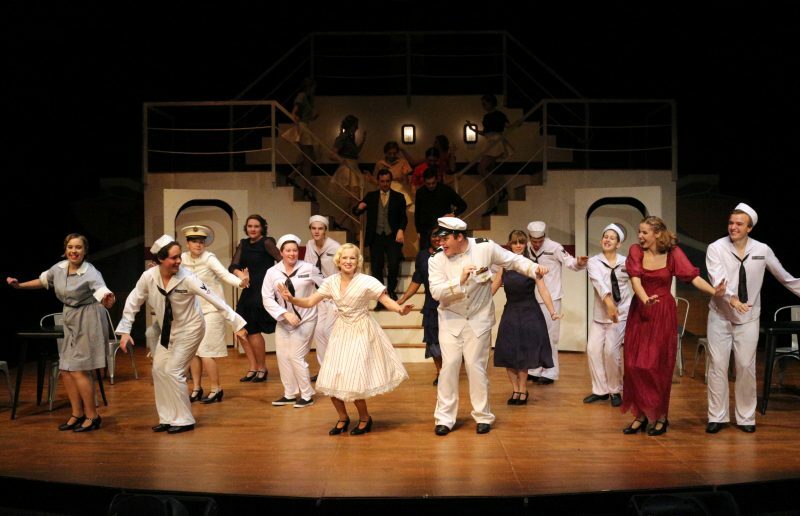 “‘Anything Goes’ presents a chance for our students to explore a completely different side of musical theatre,” Wittman said, noting that the genre influences everything from costume design to dancing styles. “It also provides multiple opportunities onstage and backastage with a company of more than 75 students” including the cast of 35, the orchestra, the technical crew, and students managing ticket sales, he said. Theatre doors open 30 minutes before each show. Tickets can be bought online at etix or at the box office, open 1 – 4 p.m. Monday – Friday and 45 minutes before each show. Call the box office at 434-544-8380 for more information.